Three-tier architecture is an architectural deployment style that describe the separation of functionality into layers with each segment being a tier that can be located on a physically separate computer. They evolved through the component-oriented approach, generally using platform specific methods for communication instead of a message-based approach. This architecture has different usages with different applications. It can be used in web applications and distributed applications. The strength in particular is when using this architecture over distributed systems. In this course work, I will furthermore invest this through the example of three-tier architecture in web applications. 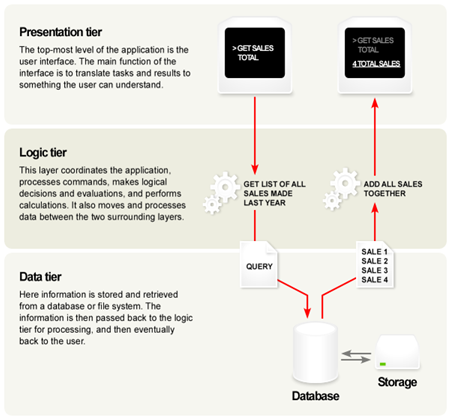 Using this architecture the software is divided into 3 different tiers: Presentation tier, Logic tier, and Data tier. Each tier is developed and maintained as an independent tier. This is the topmost level of the application. The presentation layer provides the application’s user interface (UI). Typically, this involves the use of Graphical User Interface for smart client interaction, and Web based technologies for browser-based interaction. The presentation tier displays information related to such services as browsing merchandise, purchasing, and shopping cart contents. It communicates with other tiers by outputting results to the browser/client tier and all other tiers in the network. The logic tier is pulled out from the presentation tier and, as its own layer; it controls an application’s functionality by performing detailed processing. Logic tier is where mission-critical business problems are solved. The components that make up this layer can exist on a server machine, to assist in resource sharing. These components can be used to enforce business rules, such as business algorithms and legal or governmental regulations, and data rules, which are designed to keep the data structures consistent within either specific or multiple databases. Because these middle-tier components are not tied to a specific client, they can be used by all applications and can be moved to different locations, as response time and other rules require. For example, simple edits can be placed on the client side to minimize network round-trips, or data rules can be placed in stored procedures. This tier consists of database servers, is the actual DBMS access layer. It can be accessed through the business services layer and on occasion by the user services layer. Here information is stored and retrieved. This tier keeps data neutral and independent from application servers or business logic. Giving data its own tier also improves scalability and performance. This layer consists of data access components (rather than raw DBMS connections) to aid in resource sharing and to allow clients to be configured without installing the DBMS libraries and ODBC drivers on each client. An example would be a computer hosting a database management system (DBMS), such as a Microsoft SQL Server database. 3 tier application architecture is characterized by the functional decomposition of applications, service components, and their distributed deployment, providing improved scalability, availability, manageability, and resource utilization. During an application’s life cycle, the three-tier approach provides benefits such as reusability, flexibility, manageability, maintainability, and scalability. Each tier is completely independent from all other tiers, except for those immediately above and below it. You can share and reuse the components and services you create, and you can distribute them across a network of computers as needed. You can divide large and complex projects into simpler projects and assign them to different programmers or programming teams. You can also deploy components and services on a server to help keep up with changes, and you can redeploy them as growth of the application’s user base, data, and transaction volume increases. Logic layer is moved outside the presentation layer and into the business layer as it enhances reuse. As applications grow, applications often grow into other realms. Applications may start out as a web application, but some of the functionality may later be moved to a smart client application. Portions of an application may be split between a web site and a web or windows service that runs on a server. In addition, keeping logic helps aid in developing a good design (sometimes code can get sloppier in the UI). Maintainability. Because each tier is independent of the other tiers, updates or changes can be carried out without affecting the application as a whole. Scalability. Because tiers are based on the deployment of layers, scaling out an application is reasonably straightforward. Flexibility. Because each tier can be managed or scaled independently, flexibility is increased. Availability. Applications can exploit the modular architecture of enabling systems using easily scalable components, which increases availability. Consider the 3-tier architectural style if the processing requirements of the layers in the application differ such that processing in one layer could absorb sufficient resources to slow the processing in other layers, or if the security requirements of the layers in the application differ. For example, the presentation layer should not store sensitive data, while this may be stored in the business and data layers. The 3-tier architectural style is also appropriate if you want to be able to share business logic between applications, and you have sufficient hardware to allocate the required number of servers to each tier. In the presentation layer the user interaction takes place as defined before. The user enters the address in the web browser and in the browser the URL is decoded into protocol/host/file, i.e. host name converted to IP address. Then an issue request is sent to remote server using appropriate protocol (usually HTTP). Also a returned HTML from the logic tier might be accepted. In the presentation layer interaction with client side scripts (e.g. using DHTML) is supported and user inputer of variety controls on the form are accepted. In the logic Tier the application’s functionality is done by performing detailed processing of data from presentation layer. Server such as Appache (or IIS) or Server Script (such as PHP) can be used to support this. With Server (Apache or IIS) the appropriate action to be taken is identified, such as fetching a file, or passing request to an interpreter. Also it sends an output back to caller in MIME package. As such support for thousands for concurrent users, multithreading (allow multiple processor to run concurrently) and caching (holding results in a temporary store to reduce recalculation) is achieved). With Server script (example in PHP) interacting with server such as accessing input or generating input is done. It interprets the requests according to business rules and past transactions from this client, and requests appropriate data from the persistence layer. It also computes the derived data and creates HTML (or GIF…) for the page. This tier consists of database servers. The interaction with the database is done using standard languages such as SQL queries using database specific protocol over TCP/IP. The data structures (for example tables) are defined and modified themselves, that insertion, updating and deleting of data for example. Data maintenance should be maintained with backup and recovered. Access to compilation of queries should be optimized, with indexing or replication of tables. An example of technology using this would be .NET that is built into the .NET framework, as ADO.NET contains a mechanism to query data out of the database and return it to the caller in a connected or disconnected fashion. 1. Presentation Layer: The client’s web browser that sends HTTP requests to the Web server. b. Translates the client’s HTTP requests into SMTP packets which are then sent to the Mail server. 3. Data Layer: The Mail server performs the following functionality, and when performed it is transformed to the Logic Layer. a. When completed, an e-mail message is sent by the sender’s e-mail client as an SMTP packet to the local mail server. b. 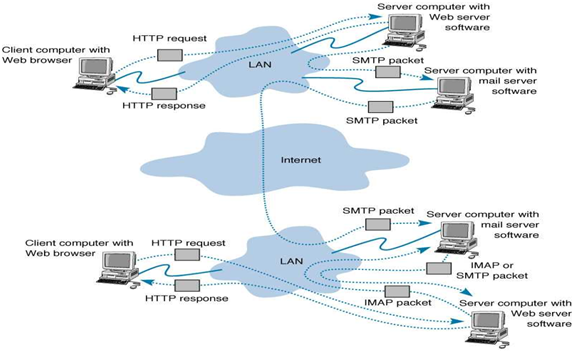 The mail server’s message transfer agent next reads the packet’s destination address and sends it over the Internet to the receiver’s mail server. c. The destination mail transfer agent then stores the message in the receiver’s mail box. d. When the receiver next accesses e-mail, his or her user agent contacts the local mail server which then downloads the message to the receiver’s client computer. I do have to say that you explained the concepts so clearly that I am going to recommended your website to everybody. 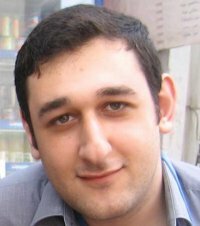 I have been searching from three tier web architectures. thanks for the well explained conceptss !!!!!! you explain three tier architecture in best way. Thanks, it is good to see the basics explained and referenced. It is a great article. It even applies to MSAccess developers (programmers). One of the advantages of using MSAccess as a quick prototype development tool is the ability to create business rules in forms, or in modules and using DSN-less linked tables to SQLServer / Azure/ Oracle or other databases. During the next development stage, the business rules can be moved out of VBA into SQLServer. Deploying the application via Citrix (or Microsoft’s new RT offering on the Cloud). This allows for rapid design of specialized business groups with around 20 to 200 users. By adhering to the concepts described, a proven working product offering can be upgraded later as to accomodate larger user communities. By keeping data in its tier (on SQL Server for example), the data is available for the business enterprise. Nice article. I need some for clarification about the image given under the section “Three-tier Architecture Example”. It doesn’t have a “presentation tier”, but only have a presentation layer. In a web application, how correct is it to separate presentation layer into a separate physical server, because you need a web server to render the GUI on client’s web browser. Are you saying that client’s web browser is the “presentation tier” ?